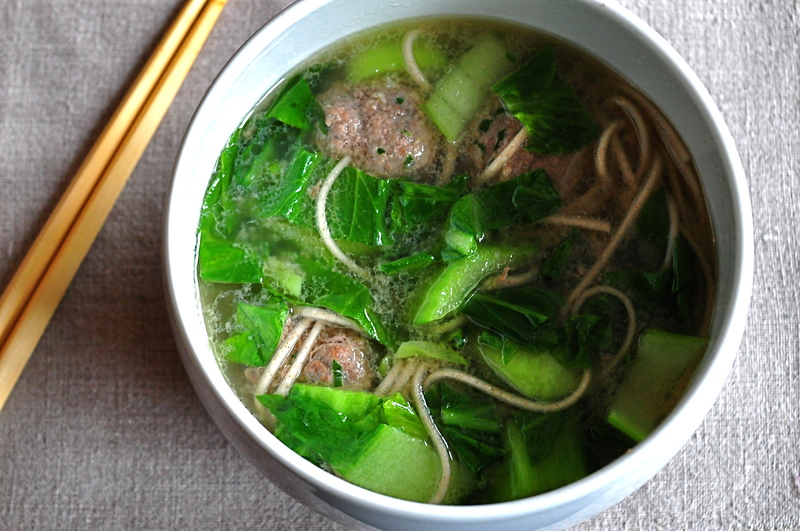 That day I happened to have all the right ingredients in my kitchen – perfect cooking serendipity: broth, ground beef, baby bok choy, soba noodles. 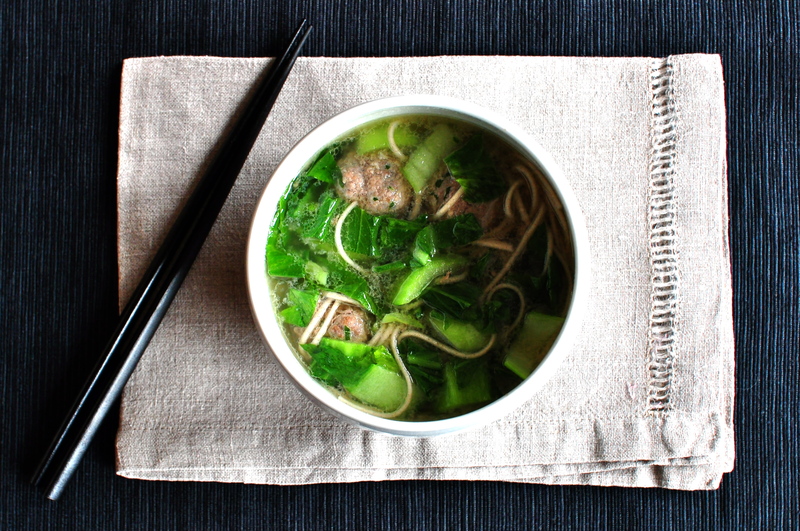 I wanted a soup that tasted zingy, comforting, fresh, far-eastern…ish. (Sadly, this is the closest I come to making anything remotely Asian. And that is one thing I hope to change.) Miraculously, the soup I hoped for was exactly what I got. Because I liked this soup very much and had nothing else on hand I was once tempted to make it with store-bought broth – it just wasn’t the same. I don’t make a science out of cooking chicken broth. Whenever I roast a chicken, I throw the bones into a saucepan, cover them generously with (filtered) water, add whatever happens to be in the fridge – chunks of carrot or celery, a wedge of onion, a sprig of parsley, or just a few peppercorns, a bay leaf, and a squeeze of lemon juice (or vinegar) if that’s all there is. It boils for a couple of hours, it’s drained, and it’s done. I usually add salt to the broth just before using it – it seems to be a better way of controlling the seasoning. In a mortar, grind the fennel seeds finely and set aside, then crush the garlic together with the salt to form a paste, and combine with the ground fennel. Finely chop the onion and the parsley. In a bowl, thoroughly mix the meat with all the other ingredients: fennel/garlic/salt mix, onion, parsley, egg, and lemon zest. Shape the meat into small balls, no larger than 1 inch (2.5 cm) in diameter (will make approximately 24). To prepare the baby bok choy, remove any damaged outer leaves, cut into 1/2 inch (1 cm) strips crosswise, and wash in cold water to remove any grit. Cut the ginger into matchstick-thin strips. Season with garum and soy sauce and serve immediately. This entry was posted on 25 February 2011 at 13:27 and is filed under Fall, Fall soup, Seasonal, Soup, Spring, Spring soup, Winter, Winter soup. You can follow any responses to this entry through the RSS 2.0 feed. You can skip to the end and leave a response. Pinging is currently not allowed. just bought some soba yesterday with this recipe in mind and hope to try it very soon! I hope you like it as much as I do (and please let me know how it went)! Thank you very much! I think this soup would also be very good with chicken – I will try that next time.